Now that my schedule is starting to slow down a bit I'm finding more time to squeeze in some reading each day. Even if it's only for 10 minutes I feel better and enjoy some "me" time doing what I love most. I managed to finish two books completely for this month, both of them were centered around the food industry, I apologize if these don't interest you at all. I can't help it, I'm fascinated with anything to do with food. These two books have been on my list and I'm glad I took the time to read them. Pandora's Lunchbox is pretty new to bookshelves, I can't remember where I first heard about this book but I immediately put it on my to-read list. I will admit even for someone that loves reading about our food industry this was a little advanced, there were moments when I thought I would become uninterested. It's very technical at time but overall I'm glad I finished it and took a lot away. 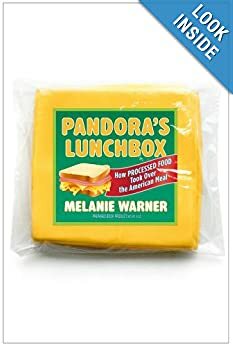 Author Melanie Warner explores just exactly how processed food is made, anything from our breakfast cereals, yogurt, sliced American cheese to those chicken nuggets so many parents rely on for quick meals. It's only common sense to know that all of these foods contain many preservatives but to know how these chemicals are formed is another. * One of my favorite Subway sandwiches, the Sweet Onion Chicken Teriyaki contains 105 ingredients in just the bread, chicken and sauce alone. This really grossed me out! Of those 105, 55 are dry, dusty substances that were added to the sandwich for a variety of reasons. I think I will have a hard time eating another one of those. * The amount we pay for food has dramatically declined over the years. From 20.6% in 1950 to now only 9.8% of our income. That's lower than any other country. Now I realize that we are on budgets especially when it comes to groceries but really what this is telling us; is we rely on way too much cheap, processed foods to feed our families. We can shell out money for TVs, brand new cars and the latest electronics but then resort to fast food and packaged junk to feed our children. Something is wrong with this picture. * In our system we have about 5,000 food additives that are allowed, over half of them being food flavorings. Wow, I had no idea that so many of these existed. I know where I stand when it comes to packaged processed foods, I really try hard to limit the amount of these items in our home. There are times though that I bake a dessert with the help of a brownie mix, the kids love cereal some mornings and of course my hubby loves his grilled American cheese sandwich. I think moderation is key. It's almost impossible to avoid any sort of food additive in our society. I think that if more Americans took even just 20-30 minutes out of their busy day to prepare at least one good, wholesome meal for their family it would make a huge difference. We have got to stop relying on junk and fast food to nourish our children. Okay, stepping off my soapbox now. I'm not sure that everyone would appreciate Warner's message, but I do think it will open your eyes to what we're really eating each and every day. I've never particularly been a fan of school lunches growing up, I always thought the food was disgusting. We didn't have an on-site kitchen and our food was transferred over from another school, so you can imagine by the time it got to us it was pretty soggy. My own girls take their lunches almost every day, there are a few instances where they've ask to eat lunch at school but for the most part they don't enjoy what's being served. I don't think it has anything to do with being picky, as they are pretty good at trying most anything. I don't think the quality of the food being served in our district is all that great. I do think it's improved somewhat and I commend them for taking actions to incorporate more fresh produce into our children's meals. With that being said, I admire the challenge author Sarah Wu took on for one whole year. 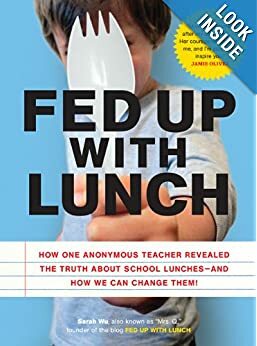 In her book Fed Up With Lunch, elementary school teacher Sarah Wu forgets her lunch one day and is forced to eat a public school lunch. She's shocked at what students were being served each day and that's when she decided to start her year-long project and blog each day about what she was eating. Along the way she was able to understand why students were dozing off in the afternoons and not able to focus as well. Could it have anything to do with the fact that lunches are so rushed, giving students only about 15 minutes to scarf down their food? She noticed many times students only had time to consume their chocolate milk and possibly a sugar filled fruit jello cup. As a parent of young children I really enjoyed this story and was made more aware of what things need to be changed in our school systems. I love the fact that in our district many schools are now growing their own gardens, teaching students about gardening and where our foods come from. I hope they will continue to incorporate fresh produce into our children's meals each day. I loved Wu's suggestions for getting more involved and how we help to bring about change. It's obviously not an easy task but I think if parents can all work together and voice their opinions maybe we can start to make some huge changes in our food system.